The email usually claims the recipient is due a large tax refund and then asks them to click on a link to another website where their money can supposedly be claimed. The email looks very convincing but there are a couple of important details that give their game away, says Inland Revenue chief information security officer Doug Hammond. “Firstly look where the email is from. If it doesn’t come from an address that ends with ird.govt.nz then be very suspicious,” says Hammond, in a statement. “Secondly, look at the link where they are trying to direct people to claim the refund. 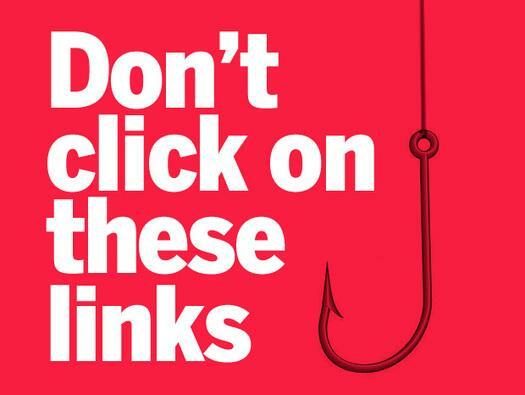 Hover over the link with your mouse and make sure the web address is for a real Inland Revenue website. Don’t click on it. Hammond says this particular scam has been quite common lately and IRD has received around 700 notifications about it in the past week. “The same scammers look to be making multiple attempts to lure unsuspecting customers and have been using the same messaging sent from a number of email addresses,” says Hammond. 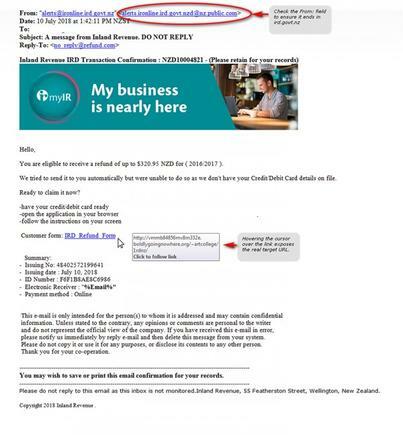 He says anyone who receive an email but is unsure about it should contact Inland Revenue at phishing@ird.govt.nz. If you have clicked on the form and submitted any personal or credit card data, Hammond advises contacting your bank immediately and IDcare (phone 0800 201 415).